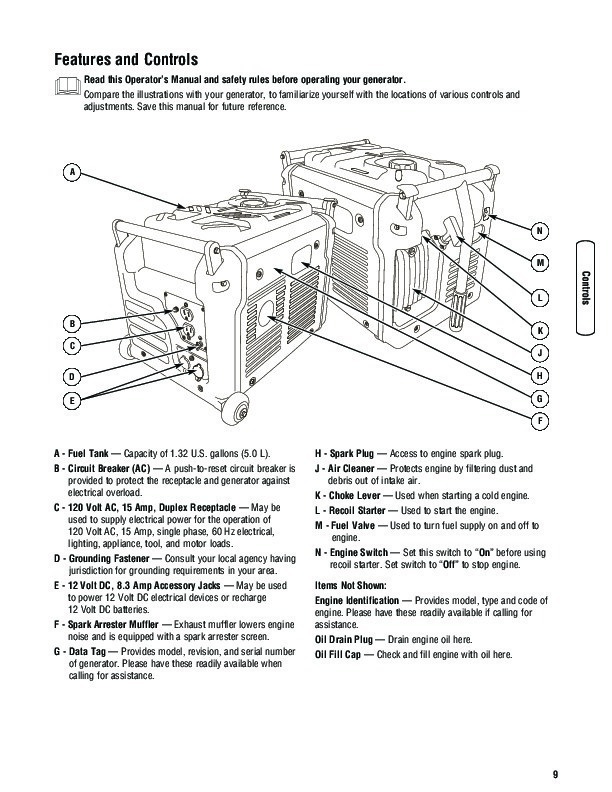 SERVICE 2007-12 O0707903 531 30 97-18 2000 Watt Portable Generator 420GN Operator’s Manual Manual No. 203861GS Revision A (09/19/2007) Thank you for purchasing this quality-built Husqvarna generator. We are pleased that you’ve placed your confidence in the Husqvarna brand. When operated and maintained according to the instructions in this manual, your Husqvarna generator will provide many years of dependable service. 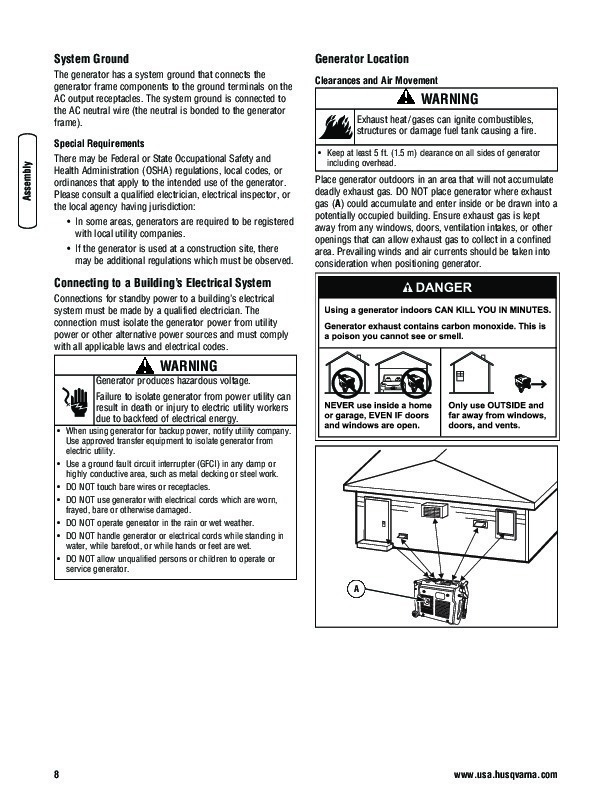 This manual contains safety information to make you aware of the hazards and risks associated with generator products and how to avoid them. This generator is designed and intended only for supplying electrical power for operating compatible electrical lighting, appliances, tools and motor loads, and is not intended for any other purpose. 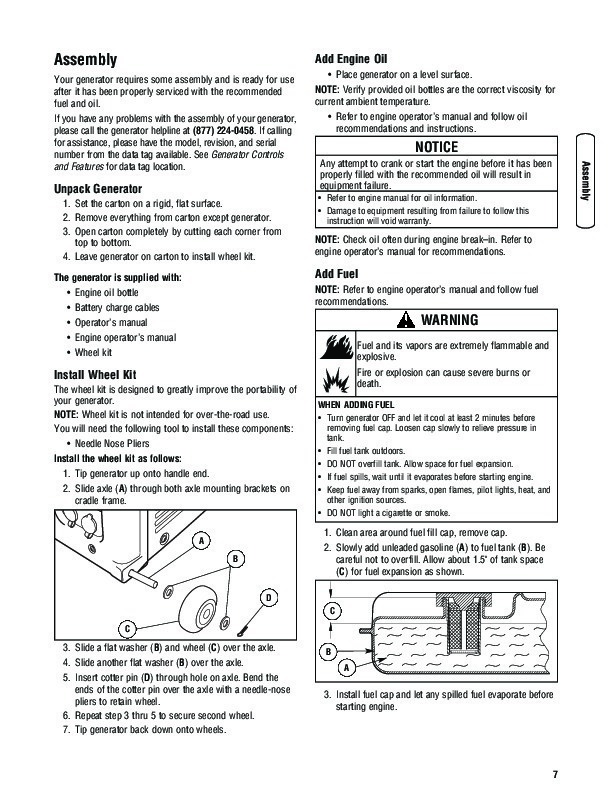 It is important that you read and understand these instructions thoroughly before attempting to start or operate this equipment. Save these instructions for future reference. This generator requires final assembly before use. Refer to the Assembly section of this manual for instructions on final assembly procedures. Follow the instructions completely. Where to Find Us You never have to look far to find Briggs & Stratton support and service for your generator. Consult your Yellow Pages. There are over 30,000 Briggs & Stratton authorized service dealers worldwide who provide quality service. You can also contact Husqvarna Customer Service by phone at (877) 224-0458, or on the Internet at www.usa.husqvarna.com. 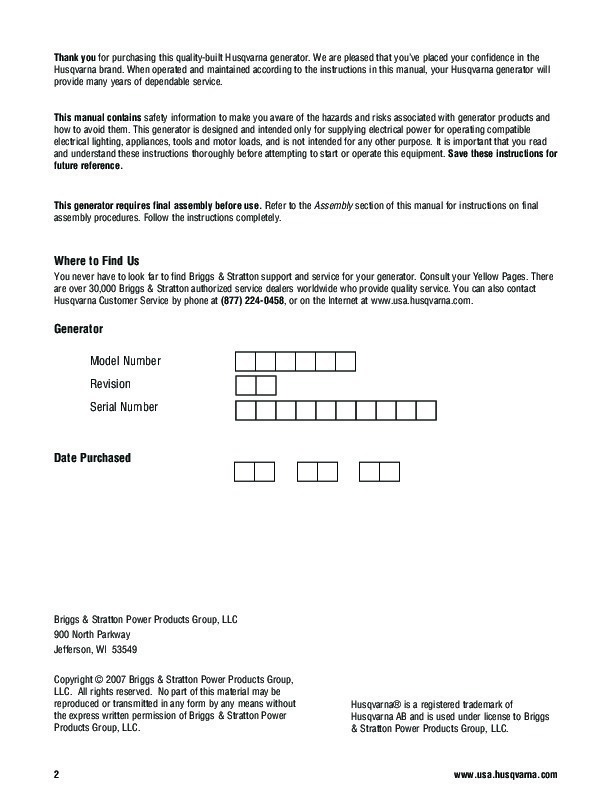 Generator Model Number Revision Serial Number Date Purchased Briggs & Stratton Power Products Group, LLC 900 North Parkway Jefferson, WI 53549 2007 Briggs & Stratton Power Products Group, LLC. No part of this material may be reproduced or transmitted in any form by any means without the express written permission of Briggs & Stratton Power Products Group, LLC. Husqvarna® is a registered trademark of Husqvarna AB and is used under license to Briggs & Stratton Power Products Group, LLC. 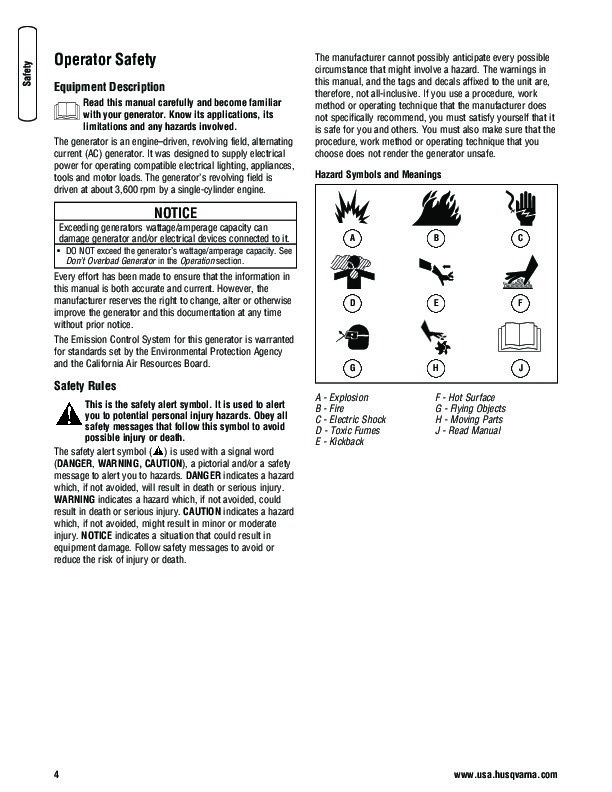 2 www.usa.husqvarna.com Table of Contents Operator Safety . 4 Equipment Description . 4 Safety Rules . 4 Assembly . 7 Unpack Generator 7 Install Wheel Kit 7 Add Engine Oil . 7 Add Fuel 7 System Ground 8 Connecting to a Building’s Electrical System 8 Generator Location . 8 Features and Controls . 9 Cord Sets and Receptacles 10 Operation 11 Starting the Engine 11 Connecting Electrical Loads 11 Stopping the Engine 11 Charging a Battery . 12 Cold Weather Operation . 12 Don’t Overload Generator . 14 Maintenance 15 Generator Maintenance . 15 Engine Maintenance 15 Storage . 16 Troubleshooting 17 Warranty . 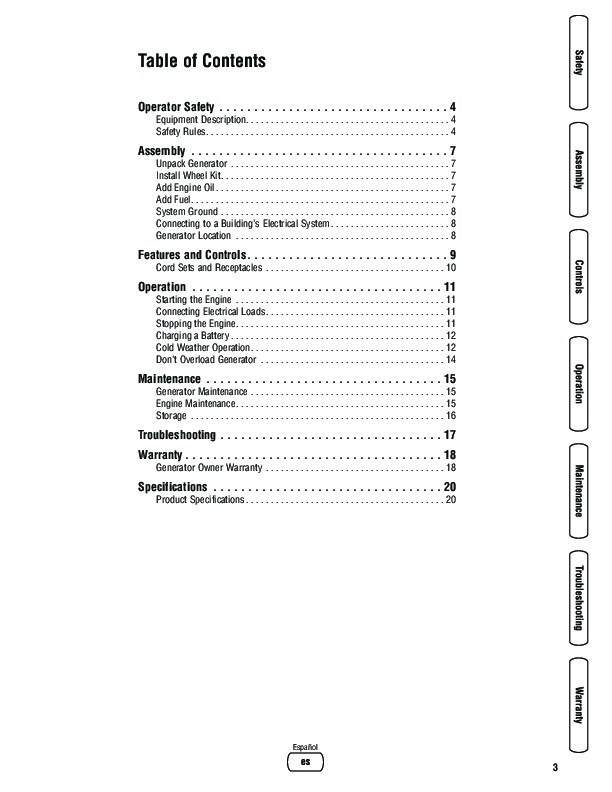 18 Generator Owner Warranty 18 Specifications . 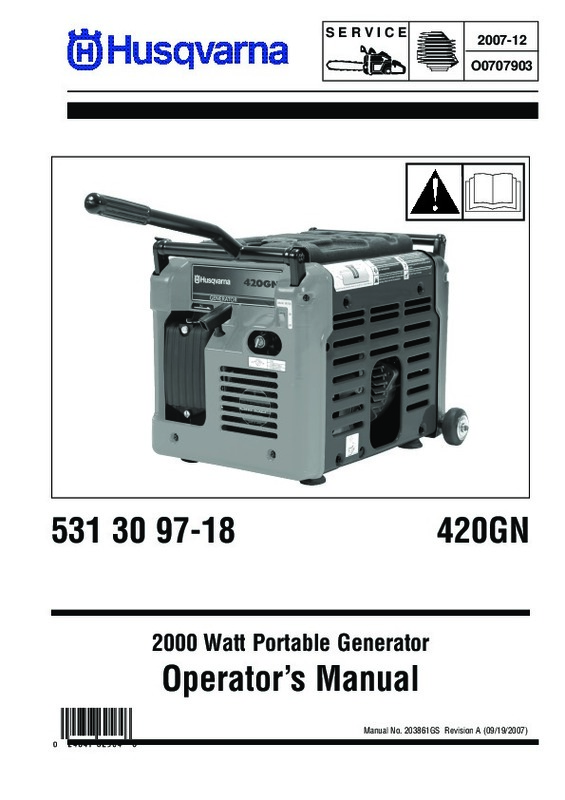 20 Product Specifications 20 Español 3 Operator Safety Equipment Description Read this manual carefully and become familiar with your generator. Know its applications, its limitations and any hazards involved. The generator is an engine­driven, revolving field, alternating current (AC) generator. It was designed to supply electrical power for operating compatible electrical lighting, appliances, tools and motor loads. The generator’s revolving field is driven at about 3,600 rpm by a single-cylinder engine. The manufacturer cannot possibly anticipate every possible circumstance that might involve a hazard. The warnings in this manual, and the tags and decals affixed to the unit are, therefore, not all-inclusive. If you use a procedure, work method or operating technique that the manufacturer does not specifically recommend, you must satisfy yourself that it is safe for you and others. You must also make sure that the procedure, work method or operating technique that you choose does not render the generator unsafe. 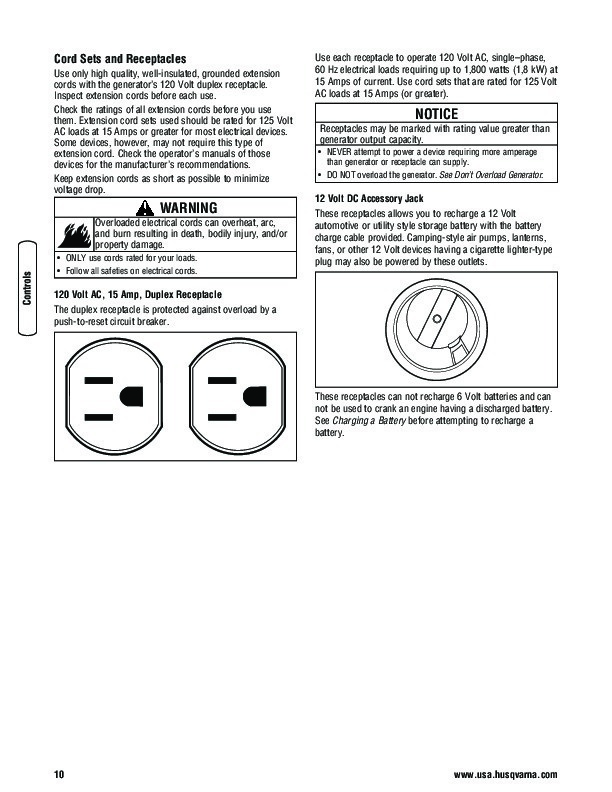 Hazard Symbols and Meanings NOTICE Exceeding generators wattage/amperage capacity can damage generator and/or electrical devices connected to it. · DO NOT exceed the generator’s wattage/amperage capacity. See Don’t Overload Generator in the Operation section. A B C Every effort has been made to ensure that the information in this manual is both accurate and current. However, the manufacturer reserves the right to change, alter or otherwise improve the generator and this documentation at any time without prior notice. The Emission Control System for this generator is warranted for standards set by the Environmental Protection Agency and the California Air Resources Board. D E F G H J Safety Rules This is the safety alert symbol. It is used to alert you to potential personal injury hazards. Obey all safety messages that follow this symbol to avoid possible injury or death. The safety alert symbol ( ) is used with a signal word (DANGER, WARNING, CAUTION), a pictorial and/or a safety message to alert you to hazards. DANGER indicates a hazard which, if not avoided, will result in death or serious injury. WARNING indicates a hazard which, if not avoided, could result in death or serious injury. CAUTION indicates a hazard which, if not avoided, might result in minor or moderate injury. 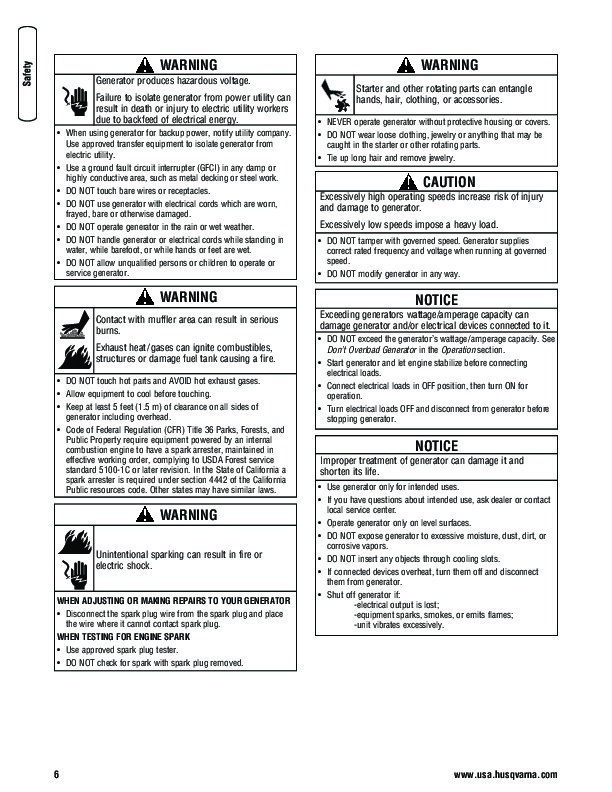 NOTICE indicates a situation that could result in equipment damage. Follow safety messages to avoid or reduce the risk of injury or death. 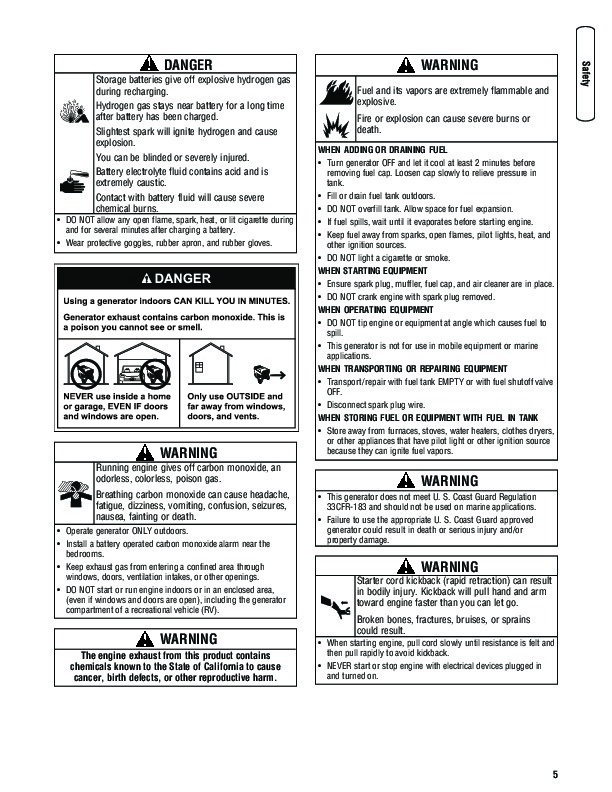 A – Explosion B – Fire C – Electric Shock D – Toxic Fumes E – Kickback F – Hot Surface G – Flying Objects H – Moving Parts J – Read Manual 4 www.usa.husqvarna.com DANGER Storage batteries give off explosive hydrogen gas during recharging. Hydrogen gas stays near battery for a long time after battery has been charged. Slightest spark will ignite hydrogen and cause explosion. You can be blinded or severely injured. Battery electrolyte fluid contains acid and is extremely caustic. Contact with battery fluid will cause severe chemical burns. · DO NOT allow any open flame, spark, heat, or lit cigarette during and for several minutes after charging a battery. · Wear protective goggles, rubber apron, and rubber gloves. WARNING Fuel and its vapors are extremely flammable and explosive. Fire or explosion can cause severe burns or death. WHEN ADDING OR DRAINING FUEL · Turn generator OFF and let it cool at least 2 minutes before removing fuel cap. Loosen cap slowly to relieve pressure in tank.